I am deeply enjoying the conversations about journaling that have been happening since I posted my first video two weeks ago. Some of you have mentioned that my posts have encouraged you to get back to journaling; some of you have emailed me and said you are going to try your own version of a "creative journal" where you hold yourself accountable to the big dreams or the day-to-day business stuff. I am guessing some of you just kind of fell in love with the Smash journals when you saw them. Some of you are trying the "Jen Lee-inspired method" of keeping one main notebook/journal of everything. I just love how these conversations are unfolding and I so appreciate you sharing your experiences with me. Seeing your journals pop up on Flickr and Instagram and Twitter made me think that it would be fun to have a journaling Flick group where we could cheer each other on and share ideas and pages and other good things. I have decided to call the group "Notes for the Journey" because that is what journaling feels like for me; notebooks and journals in all their forms become a place to capture pieces of ourselves that often become the notes we piece together to make sense of our experiences. This group isn't just for Smash journals or business journals. It is simply a group to share photos of your journals and where you journal. 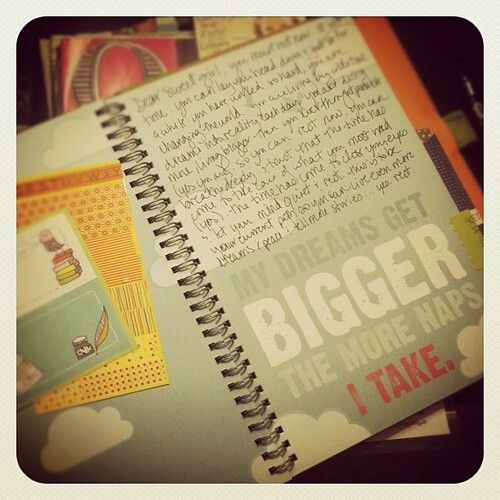 You might share the pages inside your journal, notes about how your are journaling, and so on. If you are trying to create a daily journaling practice, you might post a photo each day of your journal and the mug of tea you drink while you write. If you are a journal buying addict (ahem...I now know I'm not the only one), you could share your finds. My hope is that we can support each other through sharing photos. I know it will help me hold myself accountable just a bit more so I keep going with this practice. Just click here to join the group and start sharing (you will need a Flickr account). UPDATED :: A group of us is now using the hashtag #journeynotes over on Instagram if you want to join in. As I focus on my own journaling habits and needs, I will continue to share what I am discovering and talk about how holding myself accountable is affecting me. I also plan to share some prompts or invitations every now and then that might inspire you to write in your own journals (or on your blogs). In that spirit, I want to tell you about an exercise I did this week. As I mentioned in my previous posts about my new "creative wholeness journal," I have a section about self-care. In this section, I am listing my go-to self-care practices so that I can turn to them when I begin to notice I am feeling depleted but also when I just have a few minutes to myself and need a place to begin. Earlier this week, I turned to the page shown in the photo above and decided to write myself a gentle reminder to rest. I thought about all the women I have connected with through the Be Present Retreats during the last three years. I thought about the stories they have shared and the ways in which we have held the space for one another as these words are spoken aloud. I thought about you and you and you and what I would most want to tell you if you needed a reminder to rest so that you could keep living your dreams into reality. And then I wrote the words in letter form right into my journal. In your journal, write yourself a self-care letter that tells you whatever you most need to hear in this moment. Maybe you need a reminder to rest or to pay more attention to when you are hungry or maybe you need to give yourself permission to write and dream and know you are enough. A few people have emailed asking about where I have purchased my Smash journals. Here in Tacoma, there is a local store called Artco Crafts that is carrying them and has them on sale right now. I have also seen the accessories at Michael's and their website indicates the stores carry the journals. Amazon has quite a few Smash journals and products available (and they have the best prices I think). It looks like they are available at Paper Source. Please share any shops where you have seen them.